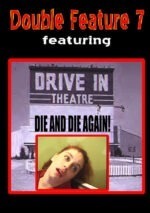 See Laura Giglio, Pamela Sutch, Cristie Clark, Lonna Cottrell, Dakotah, and Debbie D all sink to their deaths! Also, see Dawn Murphy fight for her life in the quicksand! This is the tape you’ve been waiting for! This is a special edition of GRUESOME DEATHS, featuring only quicksand scenes. All of our best quicksand scenes are here!